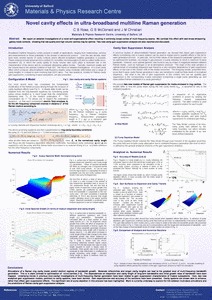 Rose, CS, McDonald, GS and Christian, JM 2010, Novel cavity effects in ultra-broadband multiline Raman generation , in: National Photonics Conference, Photon 10, 23-26 Aug, 2010, Southampton, UK. 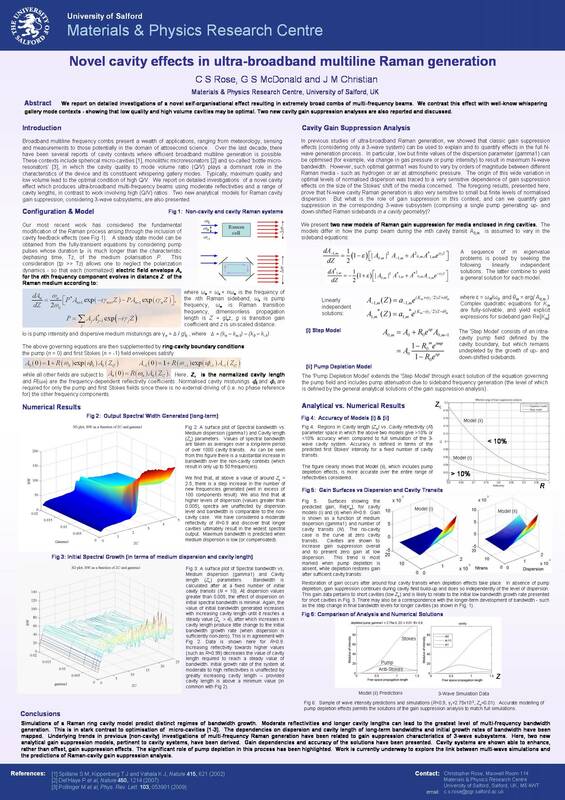 Broadband multiline frequency combs present a wealth of applications, ranging from meteorology, sensing and measurements to those potentially in the domain of attosecond science. We report here on detailed investigations of, what we believe is, a novel Raman self-synchronous process that is accompanied by extreme enhancement of the bandwidth of the generated frequencies. Over the last decade, there have been several reports of cavity contexts where efficient broadband multiline generation is possible. These contexts include spherical micro-cavities , monolithic microresonators  and so-called ‘bottle micro-resonators’ , in which the cavity quality to mode volume ratio (Q / V ) plays a dominant role in the characteristics of the device and its constituent whispering gallery modes. Typically, maximum quality and low volume lead to the optimal condition of high Q / V. To illustrate distinctiveness from these well-known contexts, we stress that the effects we report can be optimal in either low-Q resonators (with very moderate reflectivities) or larger volume cavities (e.g. with longer cavity lengths). For example, Figure 1 presents cavity-enhanced bandwidths after: (a) a short number, and (b) a large number, of cavity transits. The baseline for comparison (without a cavity present) is a bandwidth of around only 30 to 50 frequencies. <FIGURE 1> Figure 1: Surface plots – each demonstrating generated bandwidths consisting of well in excess of 100 distinct frequencies. Dependencies on levels of dispersion and cavity length are explored. (a) Bandwidth generated after only 10 cavity transits. (b) Long-term bandwidth generation (after many cavity transits). We will summarise results from an exhaustive exploration of this new effect (in terms of cavity parameters) and compare these results with two new semi-analytical models we have developed to lend insight into the origins of this bandwidth enhancement, and its correspondence with self-synchronisation. References  Spillane S M, Kippenberg T J and Vahala K J, Nature 415, 621 (2002). Del’Haye P et al, Nature 450, 1214 (2007). Pollinger M et al, Phys. Rev. Lett. 103, 053901 (2009).